Even if Iraq's elections are carried off with some modicum of success on Jan. 30, the real question is what happens after the votes are counted. Despite a sharp debate in recent weeks over whether to delay the balloting to allow for improved security and to bring more Sunni Arabs into the process, the administration has stuck firmly to the timeline for the vote. Under the current plan, in two weeks Iraqis will elect a 275-member transitional National Assembly -- empowered to make laws, choose a prime minister and president, and write the nation's new constitution -- along with 18 provincial assemblies and a 105-member Kurdistan National Assembly in the semi-autonomous Kurdish north. But what then? Most public discussion has focused on the vote itself. Democracy, however, does not consist simply of voting. If the elections proceed on Jan. 30, and a reasonable degree of order is maintained, there remains the question of what happens on Jan. 31, when the work of governing really begins. Nevertheless, asked what a successful outcome might look like, several of the experts were willing to sketch out scenarios in which the elections could, to some degree, work. If, through a combination of luck and inspired politicking, the fledgling Iraqi government finds a way to reach out to those who are effectively disenfranchised by the election process or distance itself, at least symbolically, from the US, Iraq might still avoid the grim scenario of ethnic warfare and chaos that even the most optimistic observers acknowledge is an all too realistic possibility. Yet the geographical distribution of the vote matters more than the raw numbers. Rather than have members of the National Assembly elected from each province, the election will treat the entire country as one electoral district, awarding seats to parties, or coalitions of parties, on a proportional basis. While this avoided the time-consuming and contentious process of drawing electoral district boundaries -- which, it was argued, would have made voting by Jan. 30 impossible -- it also ensures that any area with low turnout stands to be underrepresented. The parties popular in the predominantly Sunni Arab provinces, where the insurgency is centered, are therefore likely to do poorly. The formerly dominant Sunni Arab minority, which accounts for roughly 20 percent of Iraq's population (the Shia make up over 60 percent and the Kurds approximately 20 percent), may very well find themselves with only a handful of seats. 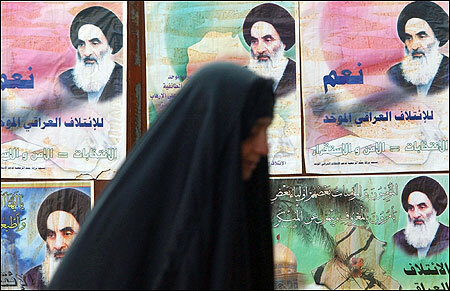 For example, while Shiites, at the urging of Grand Ayatollah Ali al-Sistani, are expected to vote in large numbers, ''you might still have lower than expected turnout in Shia areas because of insecurity.'' That would favor voters in the largely peaceful Kurdish north -- where turnout for the Kurdish Assembly elections has traditionally been around 90 percent -- and delegitimize the Assembly in the eyes of the Shia. It would also embolden the Kurds who, with the most powerful militias in the country and barely concealed separatist ambitions, might push for de facto independence, flirting with civil war while angering neighboring Turkey and Iran, countries with their own restive Kurdish minorities. Nevertheless, says Larry Diamond, a democratic development specialist at Stanford University's Hoover Institution and former senior advisor to the Coalition Provisional Authority in Baghdad, the election will almost certainly be ''a thumping victory'' for the United Iraqi Alliance, the Sistani-endorsed coalition of mostly Shia parties. Yet a Shia-dominated government will need to gain the trust of the Sunnis, and perhaps even the Kurds, if it is to maintain stability. But even a government with perfect ethnic balance will still be vulnerable to the perception that it is captive to the interests of the occupying Americans. To remedy this, some experts predict, the Iraqi government may seek a symbolic break with the United States. Such distancing from the United States, Feldman says, could be used as a bargaining chip with the insurgents. ''The government can say, If you put down your arms, we will kick out the Americans. If you do not we will crush you in a way that will make the Americans look like wimps.''' Feldman hastens to add that he's not at all sure an Iraqi government could make good on either promise. ''But the point is they can offer both a much more accommodationist and a much harsher line than we have,'' he says. But according to Peter W. Galbraith, who served as US ambassador to Croatia in the years after the Bosnian War and then as a high official in the UN's transitional administration in East Timor, the only way forward is for the new Iraqi government to relinquish its newfound power rather than flex it. Galbraith, who supported the Iraq invasion on humanitarian grounds, sees the entire idea of a centralized Iraqi government as misguided and the elections as irreparably flawed. Ultimate sovereignty, as he sees it, should reside separately with the Sunnis, Shia, and Kurds in a loose tripartite confederation. For Galbraith, the situation calls to mind Yugoslavia after the Cold War. One reason it fell apart, he says, ''is that Milosevic basically refused to accommodate the desires for greater autonomy on the part of the Slovenes and the Croats.'' Similarly, he argues, the Bush administration ''has been proceeding on the assumption of a single Iraq, rather than acknowledging the reality of a country with three groups, with very different agendas, and first trying to broker a deal among the groups'' before trying to have an election.